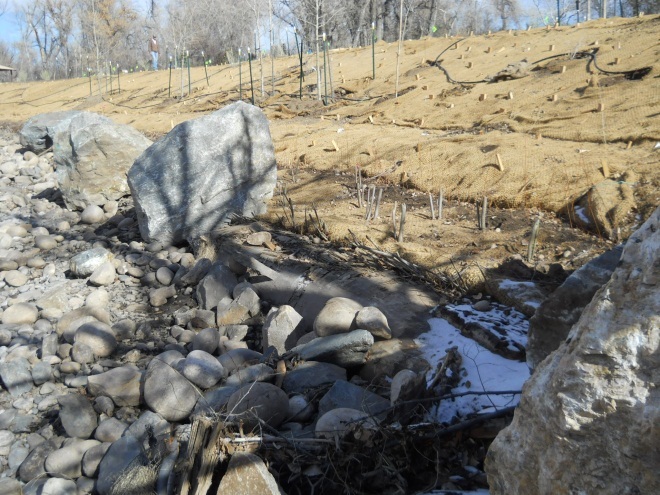 The Lions Park River Restoration and Bank Stabilization Project (Project) situated along the Cache la Poudre River (Poudre River) in LaPorte, CO was completed in winter 2012. It had less than one growing season of maturation before the September 2013 floods hit it, yet it survived a 100-year event with only minimal damage. This Project provides significant evidence that creative solutions such as bioengineering can provide substantial riverbank, channel and floodplain stability while creating natural habitat and recreation opportunities. It is human nature to live, work and recreate along and adjacent to waterways, as our lives and histories are inextricably linked to water. How we affect those waterways has long-term survival consequences not only for fish and wildlife, but for humanity. A better understanding of the natural, dynamic processes inherent to river systems, and the factors that impact their natural equilibrium, are required to balance the protection of life and livelihood with the protection and restoration of valuable habitat for fish, wildlife and people. Reduced instream habitat variability (frequency and depth of pools). Development of land in floodplains results in the removal of areas in which flood water is temporarily stored during a flood event. This storage is an important factor in the attenuation of flood peak flows, and also in the reduction of flood levels. This effect is particularly greater in stream systems with significant tributary flows. So, what can be done to protect people and property without destroying habitat? Appropriate uses of riverbank, riparian, and floodplain systems through responsible land-use practices can maintain natural processes and avoid cumulative, adverse effects. 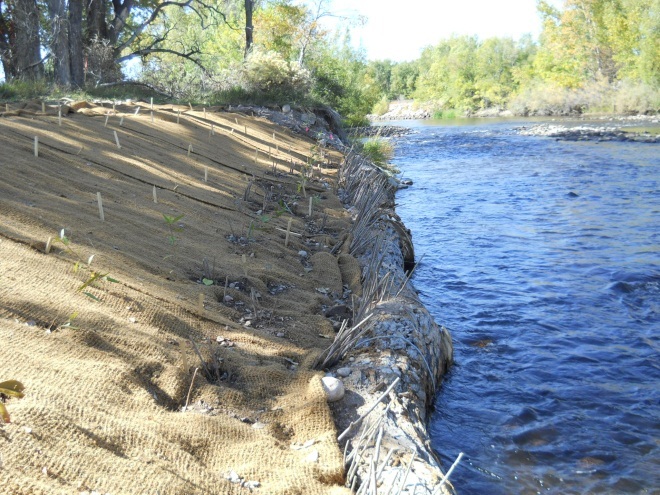 Sometimes the solution is in the design of a riverbank-protection project that protects property and infrastructure from erosion while allowing for natural, habitat-forming processes to occur. Other times the best solution is to move infrastructure and development away from the river and out of the floodplain. Effective, creative solutions require a clear understanding of the system instabilities that are occurring. The use of biodegradable materials (e.g., plant-based erosion control fabric and biologs) and other natural materials (e.g., boulders, logs, and rip-rap) with vegetation is called “Soil Bioengineering” or “Bioengineering”. ecos incorporated a Bioengineering approach to stabilize the riverbanks and overbank floodplain at Lions Park, as this approach was most closely aligned with the fishery and wildlife habitat restoration objectives of this highly utilized public park and fishing reach. The pre-project condition of the park was unstable, with 10 to 12-foot tall eroding banks, and the majority of the park comprised of unconsolidated gravel and rock that had been dredged from the river. Bank stabilization on the east bank consisted of a 350-foot long combination boulder and log toe, double terrace of fabric encapsulated soil/cobble, and a 3:1 slope covered with heavy erosion control fabric. A 15-foot long subsurface hard point (i.e., rock refusal) constructed of 3-foot (nominal) boulders was installed at the upstream and downstream ends of the treatment area to help assure that the treatment area would not be undermined in case of a catastrophic event. 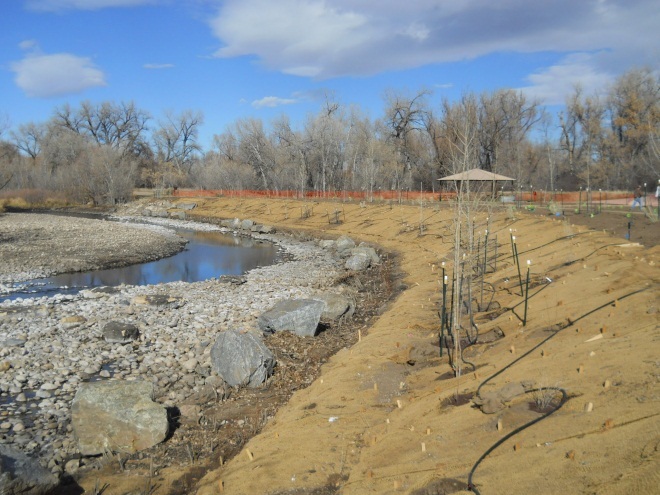 The entire east bank was seeded and planted at a high density and with a diversity of riparian and upland grasses, shrubs and trees to create a matrix of soil-stabilizing roots and riparian habitat that was previously missing. The biodegradable erosion control fabric, logs and boulders provide immediate relief to excessive erosion rates in the shorter term, while the vegetation provides more enduring stabilization over the longer term as it matures and creates a soil-binding network of roots. Both woody and herbaceous species are important for binding soil together in riverbanks and floodplains, with the combination being substantially more effective. 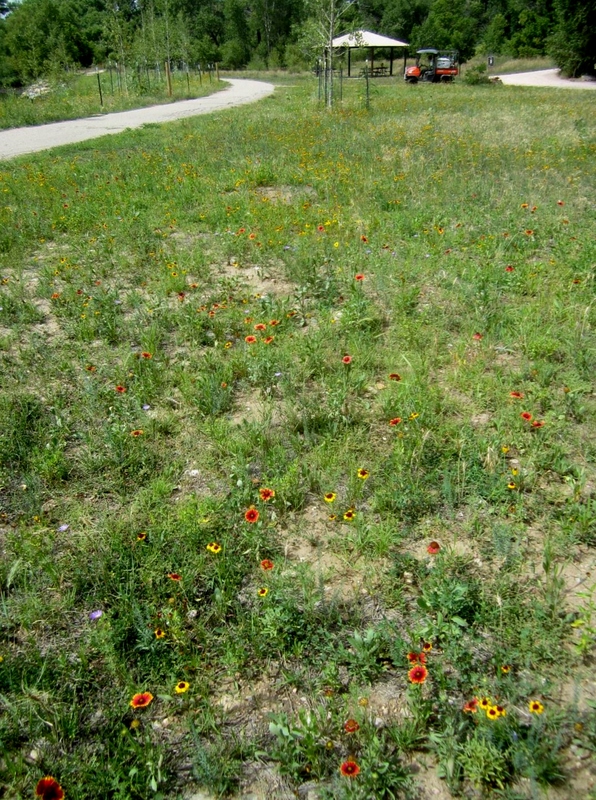 The Lions Park Project benefited from this approach as the herbaceous plants (grasses, sedges, wildflowers, etc.) germinated and matured during the first growing season before the 2013 flood. Their root systems and upper plant parts interlocked with the biodegradable fabric to significantly reinforce the soil. The trees and shrubs will mature and develop roots over time, improve soil stability and cohesion, and replace the structure provided by the biodegradable materials. Out of the total 350-foot length of active bank treatment implemented by the project on the east/outer bank, only 50 linear feet were damaged (i.e. 14%) by the flood. But for a few larger trees getting pushed over, some lost beaver/deer protection cages, and crusher fines trail material getting washed away, the fabric, plants and irrigation system on the remaining 300-foot portion (i.e., 86%) of the east bank is intact, stable and functional. The Bioengineering approach, and the overall project, likely saved Lions Park, the Poudre Trail, and the nearby homes along Overland Trail from devastation. Without the stabilization provided by the project the River would likely have eroded the eastern/outer bank, destroyed the park and trail, and accessed its previous course (via a remnant channel) carrying water and debris into the neighboring homes. All of this success was achieved by the project in the first season following construction, and it will only grow stronger with time. Lions Park is an impressive example of the strength and stability provided by a Bioengineering approach. Keep reading if your'd like more information on the project. 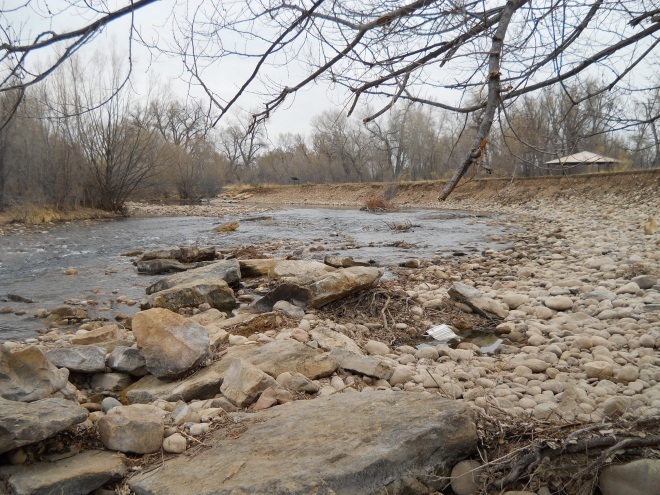 Working with the City of Greeley, ecos identified the Lions Park reach of the Poudre as a strong candidate for compensatory mitigation. The City of Greeley maintains significant water infrastructure in the Cache la Poudre River Basin and plans more. As such, Greeley will likely need compensatory mitigation (CM) in the basin to offset future impacts to water resources. The Lions Park site was among several identified using a scientific, watershed-based process. Ecos and the City ranked CM sites using a prioritization system that considered the comprehensive functions and services (i.e., desired resource functions) of the Poudre watershed, preferred mitigation types (according to the Corps of Engineers Mitigation Rules), and likelihood of success. This process identified CM projects with the highest potential to benefit the desired aquatic resource functions in the watershed, including the Lions Park site. The property is owned by Colorado Parks and Wildlife (CPW) and managed by Larimer County Parks and Open Lands. CPW and Larimer County committed their time and resources to assist Greeley in the development and implementation of this important project. 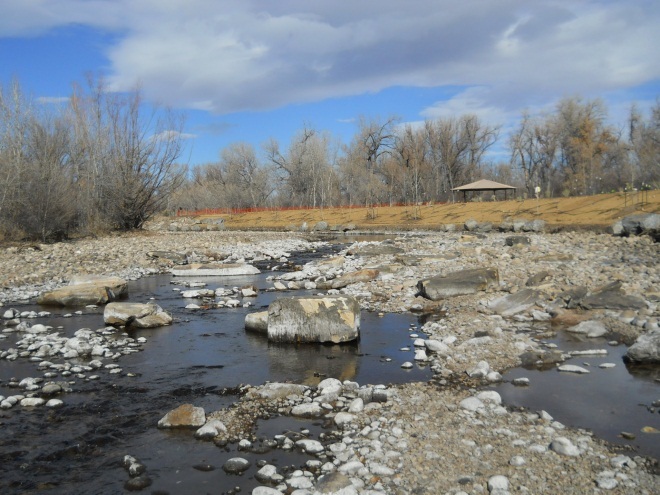 CPW voiced strong support for Greeley’s proposed river, riparian, and wetland habitat restoration efforts as Lions Park had been identified in their long-range planning goals for streambank and instream improvements to support a popular trout fishery. 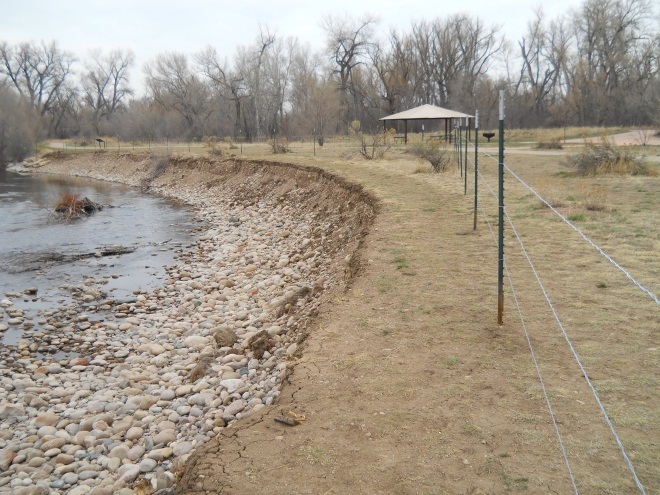 Larimer County also supported Greeley’s efforts as the site is a highly utilized public park that did not have funding allocated for necessary improvements, including stabilization of the hazardous, eroding streambank along the busy Poudre Trail. Rather than miss the opportunities presented by the Lions Park CM site due to unknown project timing, Greeley submitted a Notice of Intent (NOI) to the Corps to request credit for the restoration actions at the site. The Corps acknowledged and documented the City’s NOI to implement CM in advance of potential, future impacts to waters of the U.S. in the Poudre River watershed in March 2012; noting that Greeley was proceeding at their own risk since there are no guarantees that the Corps will permit any future projects. 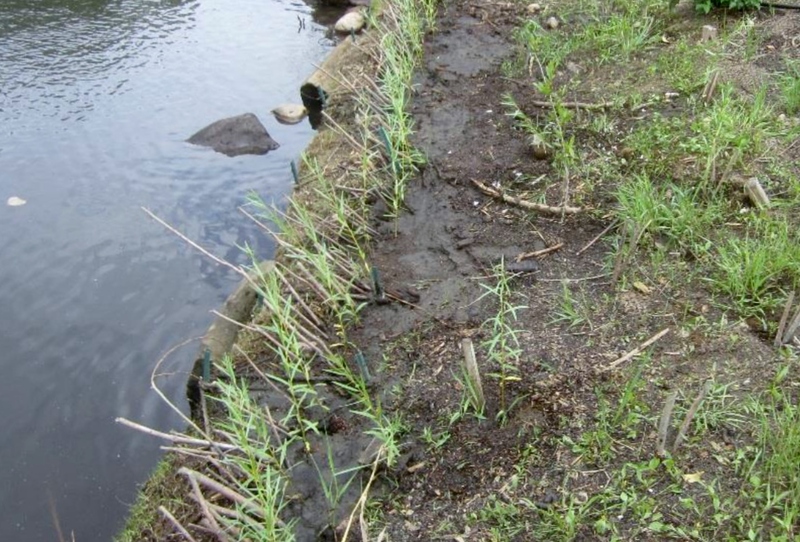 Increased colonization of herbaceous riparian and wetland plants. • Long-term protective measures, including 2 access points; wildlife friendly exclusionary fencing; and signage. Created growth conditions that encourage the establishment of overhead riparian cover that provides shade.